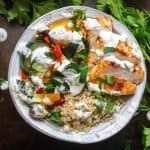 Healthy Greek Chicken Bowls are a perfect meal prep recipe! Next make the quinoa (or choose whatever grain you prefer or cauliflower rice). Pour the broth, olive oil, and salt into a medium pot over high heat. Once the liquid come to a boil stir in the quinoa. Cover with a lid, and reduce the temperature to low. Cook for around 15 minutes, and set aside. Place the chopped vegetables on a baking sheet. Drizzle the olive oil, sprinkle on the salt and pepper, and toss everything using your hands. Spread out the vegetables so they are an even layer. Bake for 15 minutes, then toss them and bake an additional 10 minutes. For the yogurt sauce, mix together the yogurt, cucumber, garlic powder, salt, pepper, lemon juice, sugar, and dill. Keep refrigerated until serving. Nutritional Information includes 1/4 cup of the Yogurt Sauce recipe.